I took two photos next to each other and blended them in Photoshop. Then I added texture and, lines and a vignette. Bryant Park is an odd place — migrants of all sorts wind up there. Created in Photoshop. NIKON D750, f-stop f/5.6, exposure time 1/125 sec. ISO 2200, focal length 400mm, and max aperture 5. This one works very well for me. I enjoy the blend of color, and also the composition itself is of interest to me. Stunning. A perfect urban nature blend. I love the bright lilac-colored flowers, offsetting the Grey Catbird. It centers my attention. Both pictures are beautiful. The muted background also adds to a sort of impressionistic look. Beautiful work, Sherry. I like the way you fused the two photos together seamlessly. Excellent technical work and the composition is perfect. Look forward to seeing more. I get the color contrast. The flower really jumps out but then the bird as a background could have been anything. For me it’s not quite in keeping with the rest of your work. 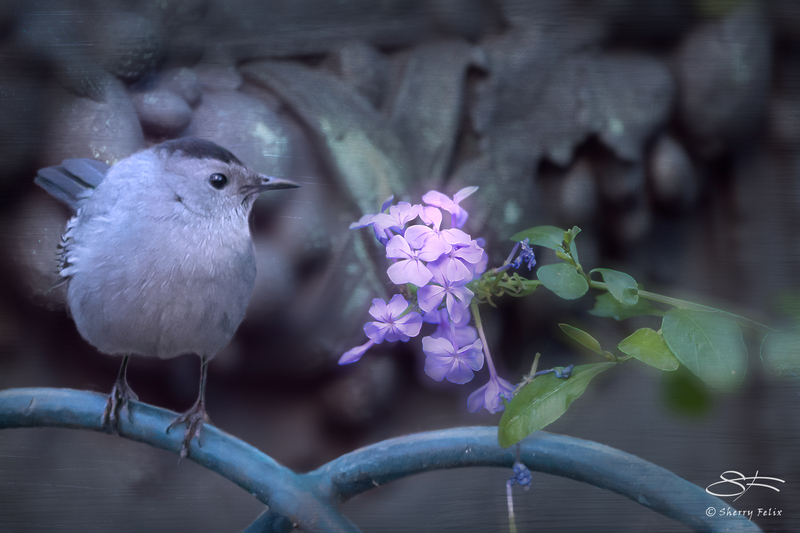 I almost feel there is a hand holding the flower for the bird to smell…which is playful, but it draws to the fact that they are not “really” together. The focal point is the flower. The flower jumps out because it has color. The bird is just a gray pointer to it. He could be thinking “Wow that’s purple !” Thanks for helping me to put my intent into words. Something I am not used to doing. I like the point you make about the bird “pointing”! My thought here was that I might like to see more color contrast between the bird and the background – but perhaps the sameness in color is a major point of this image.